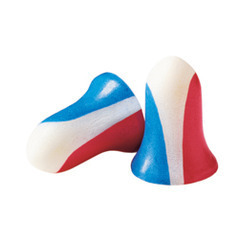 Howard Leight by Honeywell Max USA foam plugs offer the same great NRR as regular Howard Leight by Honeywell Max plugs, but these come in red, white, and blue. Regular Max earplugs are some of the most popular hearing protectors in the world. They offer excellent NRR 33 protection from hazardous noise, making them an appropriate solution for noise protection in industrial environments. They are soft and smooth, with a bell shape that helps with insertion and ensures a comfortable fit. The red, white, and blue colors just make a good thing even better. Howard Leight by Honeywell Max USA UF Foam Ear Plugs (NRR 33)5P-diddyMay 19, 2016I've been using these for almost 20 years now as a musician and in commercial construction. I've used several different brands but Howard Leight's are by far the best. The bulk pricing is very good as well. Howard Leight by Honeywell Max USA UF Foam Ear Plugs (NRR 33)5dennisApril 13, 2015These work the best for me out of many I've tried. I ordered 50 pair and should last me a long time. I use them for sleeping and motorcycling and the comfort of these plugs are great. No discomfort on all day rides stretching 500 miles plus. Also they last many uses and can be washed and reused. I still have a pair i"e used over a month and they still retain they original full shape. Great plug...nopun intended. Howard Leight by Honeywell Max USA UF Foam Ear Plugs (NRR 33)5Dick ThiesJanuary 26, 2015I have tried the different one in the sample pack plus some other brands. These are more comfortable and stay in the best of what I have tried. Howard Leight by Honeywell Max USA UF Foam Ear Plugs (NRR 33)5wayknoAugust 5, 2014Update--well, I found one I like some better than this one but this is a very good plug. I give it 5 stars even though it is not my fav... close though. Tip--watch this site's vid on proper insertion. Makes all the difference. Howard Leight by Honeywell Max USA UF Foam Ear Plugs (NRR 33)5WayknoSeptember 19, 2012I rate these in the top 3-4 I've tried and I've tried a bunch. One guy states they are too long--he should try Peltor or Moldex--I think those are too long... for me anyway. I'm guessing he didn't roll them right. One police friend of mine told me his range officer told him, incorrectly, to use lotion to help them go in his ear better! What? I told him no but he believes them. I've slept in these and they are great. Diff in these or the orange ones just like them is the color as far as I can tell. Howard Leight by Honeywell Max USA UF Foam Ear Plugs (NRR 33)5KAREN LAugust 23, 2012THE EARPLUGS ARE COMFORTABLE AND WORK WELL, I HAVE TRIED MANY DIFFERENT ONES OVER THE YEARS AND THESE WORK THE BEST. GREAT FOR TRAVEL WHEN STAYING IN HOTELS TOO! Howard Leight by Honeywell Max USA UF Foam Ear Plugs (NRR 33)5meldonMay 13, 2012too long. did not stay in my ear. Howard Leight by Honeywell Max USA UF Foam Ear Plugs (NRR 33)5LindaFebruary 16, 2011I have used several earplugs to reduce the noise level of my husband's snoring. The Howard Leight Max USA ear plugs are my favorite. They are very comfortable and work well. I have recommended them to a few different people at work and they love them too.